← New Trailer for The Avengers! Series 2 ends with Army of Ghosts and Doomsday. I’m going to review these two episodes as one story, to keep in form with the classic Doctor Who serials-as-single-entries tradition. It’s what the fans do anyway, so why argue? This is a finale, so SPOILER MODE ON. David Tennant gets to play the full range of Tenth Doctor emotions he has in this finale. It must’ve been a draining piece to play and he does it admirably. He gets a bit of the madness, a bunch of the anger, and a refreshing amount of the sadness. It’s good to see Tennant getting to play that aforementioned full range too because he was born for the job, he wanted it since he was a kid, and he’s showing it. He puts in a rather great performance to close out a good introductory season to his Doctor, what more can be said? 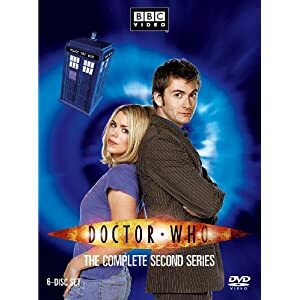 Billie Piper’s Rose Tyler bids farewell to the series that launched her into stardom with a bang. Rose doesn’t get to do as much of the heavy lifting this week in terms of the mystery-solving or companion work, but her character gets a reasonable arc in here. Seeing her do some of the work when the Doctor leaves her in the TARDIS and her exploration of Torchwood Tower were good to watch, but she rather quickly gets pushed to the side of the Dalek/Cybermen developments and all of the parallel-world-hopping. When we finally get to the ending, it avoids feeling tacked on and Piper’s emotions at the end are pitch-perfect for the character. I would be sad to see her (supposedly) go, but that’s the way of things in Doctor Who. Since we’re (supposedly) saying good-bye to Mickey Smith too, let’s talk about him. I’m not a huge Mickey fan, but even I have to admit that the evolution of the character through his two years on the show is something to be proud of. Noel Clarke does some good work here in-between the rather crap action-hero gurning forced upon him. He started far too slapstick, he (supposedly) left rather obviously, but this ending for him, staying to watch over Rose in a parallel world, I can’t help but feel bad for the guy and be proud of him as a character. In this reviewer’s humble opinion, there are too many villains in this two-parter. No one group of enemies get enough screen time. I’ll address each individually, photos and all. This was about the point in the original run where I was already getting sick of the Daleks. They are forced into the show because they’re so “cool.” Here’s the thing: They get boring. Think about it: out of the five series the show had been back on TV screens at this point, all of the finales had either the Daleks or the Master. My opinion of the Daleks has really been in a downward spiral since they first showed up in the new series (in “Dalek“) and this two-parter is no help at all. The pointlessness of the “Genesis Ark,” the meaningless yelling and shouting, the fact that they don’t remember the Doctor (the guy who once nearly undid their creation and blew up their home planet) has a Sonic Screwdriver, and they’re such utter crap again that it’s even harder to fear the Great Golden Pepperpots than usual. It really speaks to something that the Cybermen are another villain that the Doctor just makes fun of the whole time instead of treating them with some worry. It speaks to the fact that the Cybermen remain utter rubbish in the new series. I blame inferior Cybus construction. Classic Cybermen may have been rubbish too, but these guys are just so crap it hurts. Look at them. Replacing their “flawed” human bodies with, let’s be honest, bodies that have trouble walking, much less actually being threatening. The whole slinky-bodies-when-they’re-ghosts bit is confusing and only helps to show in greater detail (especially when the ghost in the playground scene grabs for the Doctor) how clunky and useless the Cybermen designs are. To make matters worse, the terribly over-articulated CGI versions (I never knew metal was made of rubber!) only serve to show how clunky the real “steel” versions are. Now, to the story. Let’s skip the whole void-full-of-nothing-except-for-plot-device-energy bit of business. It has always bugged me, but that way only madness lies. There’s some bad logic that permeates this story. For example, why is there a Torchwood in Pete’s World? There’s no Doctor there for the Queen to have founded Torchwood to oppose, right? I guess there still could’ve been a whole werewolf vs. Victoria parallel there, but I imagine it would’ve ended with Victoria as lunch, rather than not being amused. Pete’s World is written here as Who-standard-world-except-Pete-lived, but that doesn’t work when you also established a lack of Doctor and Time Vortex, so a pile of stuff would be changed other than a guy not being hit by a car in 19-80-whenever. It’s a small example, I know, but it’s part of a larger pattern of not thinking worlds through. I will give the story credit for being a good send-off for Rose and Mickey at least, with heart and energy in the last five minutes that, again, I can’t fault. Davies may falter in the big concepts, but the man has a great heart and can express it on the page. Sure, there’s fun had, but the heart, the love between the two characters (that I, grudgingly, accept) doesn’t get explored until it’s too late to matter, which should be poignant, but it’s just a waste. Missed opportunities abound, really. I am not a Rose person, but I want to be fair because I know there are a lot of them, so I’ll give this two-parter four “Hey, that’s Martha playing not-Martha!”s out of five. This entry was posted in Doctor Who Review and tagged bbc, british, cybermen, daleks, doctor who, mickey, rose, tenth doctor, TV. Bookmark the permalink.